Have I told you all how much I love blog tours? Once upon time, authors had to actually get dressed (okay, so I do have *some* clothes on, don’t worry) and leave the house to interact with readers—unless those readers were stalkers, but that is a villainous topic for another day. Now, we just go on tour virtually, linking up with the blogs of other “Authorpreneurs” who have had the nous to self-publish their works. That creates a huge network of authors and readers and maximises our opportunities for getting our books read and your opportunities for getting cool free stuff—all while we’re sitting at home wearing whatever the hell we like and hammering out our next masterpiece while sucking down a bowl of ramen noodles (the author dietary supplement of choice, for financial reasons). Recently, I was lucky enough to be invited to participate in Martin Bolton’s stupendous Heroes and Villains Blog Hop, running from 3-6 May 2013 on twenty-eight awesome author blogs. As well as writing a piece on the villains in Cruxim and how I came to make them so dastardly, I’m also giving away stacks of great swag, including books, an Amazon gift card, and jewellery (which you can check out down there *insert downward arrows dammit* at the bottom of the post). Better yet, every one of the 28 fantasy, science fiction and historical fiction authors on the tour is also giving away fabulous prizes for readers, so make sure you hop along to all of the blogs listed at the end of this post, check out their books, and enter their competitions too. So here goes … my little post filling you in on the evil workings of my own noggin. As an editor by trade, I’ve lost count of the number of times I’ve told authors that they have weak villains. When writing villains, authors have to ensure that not only is their badass just as memorable as the protagonist, but that his or her motivations are just as clear and grounded in aspects of the villain’s past and his or her personal and psychological development. In real life, sometimes it seems that we see people (hopefully from behind the safety or a TV screen, or simply in a newspaper, rather than in real life) who seem to be just straight-out plain evil monsters. We’ve all seen the news stories that made us shudder at the depths of human depravity. Sometimes, it seems like there is no rhyme or reason to such cruelty, but dig a little deeper and there is often a profile to such killers: a number of factors (not causes, let’s not make excuses for it) that might lead to the kind of evil that serial killers or psychopaths indulge in. If you’re an author like me, you’re probably a little bit fascinated by the psychology behind killers. What makes them do it? How can they live with themselves? How did they get away with it? When I was writing Cruxim, I wanted Amedeo to be faced with villains who weren’t just out to get him for the hell of it, but who actually had chips in the game. It would have been easy for my Vampire villain, Beltran, to just hate Amedeo because he is a Cruxim—after all, Cruxim eat Vampires. I’m pretty sure gazelles are not too fond of lions: same dynamic. But I wanted Beltran, who is also the primary Villain in the ongoing saga and appears in later novels, to have a real reason to hate Amedeo aside from the sheer circumstance of the supernatural food chain. That reason became Joslyn—primarily Beltran’s love for the mortal-turned-vampire, and her enduring love for Amedeo, even as he forsakes her. I drilled down to what I thought were the major psychological issues Beltran had to deal with (and again, readers will find out more about some of Beltran’s background issues in book II in the series, Creche, which I hope to have out by July. So if you don’t want to read a very slight *spoiler* look away now). Abandoned by his father as a young boy, Beltran turned his feelings of helplessness into a craving for power. At first, it was just the power to defend himself and those he loved, such as his sister Evedra. But in his longing for it, power became a kind of lust for him. When he became a vampire and finally had that power, he was unable to control either the power or the lust. It manifested as a need to dominate others, particularly women, physically. But when he meets Joslyn, he falls in love with her innocence. He hates Amedeo not only because Ame truly represents the kind of pure, honorable power Beltran once craved, but also because Joslyn loves Amedeo for that sense of honor and hates Beltran for the perverted way he abuses his own power. The other major villain in Cruxim is Dr. Claus Gandler, who I’ve found has given many readers shivers even more than Beltran. When I was stripping down his character to the bare bones (which is not a bad analogy for Gandler, given his predilection for torture and amputation), I revisited the biographies of some of the most heinous real-life villains in human history. Seriously, you couldn’t make up the kind of horrors these men inflicted on innocents. I wish I could scrub some of the things I read while researching Gandler’s character right out of my head. Among these beasts was Josef Mengele, the abhorrent, seriously depraved physician of the Nazi’s Auschwitz concentration camp, a man known as the Angel of Death. Not only did he personally order jews and those of other ethnic minorities to the gas chambers, Mengele also conducted appalling experiments into heredity upon twins and on others he considered abnormalities of nature, such as those who suffered from dwarfism or heredity conditions. Not even children were spared Mengele’s terrors. I also spent some time studying the hateful practice of travelling “freak shows” in the 18th and 19th centuries. As an Aussie author, I’d read a bit about them before, because unfortunately many Australian Aborigines were taken to Europe and exploited at such shows and “world fairs”, incorrectly portrayed as cannibals or imbecile savages. I also considered how in real life those who come into close conflict with certain afflictions sometimes come to hate others who suffer from them, and I posited how Gandler might feel if he had a child who suffered from a “freakish” disorder. What if his only son, Fritz, was killed directly as a result of having that disorder: a rare blood condition in which he produced too much blood, making him a target for vampires? Would Dr Gandler understand other “freaks” (and I use the inverted commas because I recognise that these were simply unlucky people who suffered from medical conditions), or would he hate them and use them to try to get to the bottom of vampirism, would he exploit them for his own ends? I decided to make him hate the other “freaks” he collects for all that they represent—his inability to protect his son Fritz, his hatred of hereditary imperfections. That hatred of freaks, and his desire to understand how to correct/avoid such conditions and how to end Vampirism, leads to the horrible acts of torture and “experiments” he carries out. It is only when faced with his own imminent death that Gandler makes the decision which will eventually lead to his downfall. To my mind, Gandler is a particularly evil character because of the clinical way he goes about collecting and dissecting his freaks. His is a controlled, careful kind of insanity, and sometimes that is more dangerous than all-out “batshit crazy” (a phrase which I suppose applies to Beltran in some ways). So did I achieve what I wanted to do with these villains? Yes and no. In retrospect, I wish I had spent more time letting Amedeo vanquish his foes. But in the heat of a battle, there is not really time to stop and crow over victories, however large or small; all of that must come after, and will to a certain extent in Creche. And as for Beltran … well, you’ll all just have to tune in to the next episode to see what happens to Beltran’s perverted power, and to find out how he gained such a power in the first place. You’ve hung in this far, AWESOME. So, here’s what am I giving away? * Two signed, personally addressed paperback copies of Cruxim. * Three ebook copies of Cruxim (which the lucky recipients can have signed at http://www.authorgraph.com/authors/Authorandeditor). * A $10 Amazon gift card. 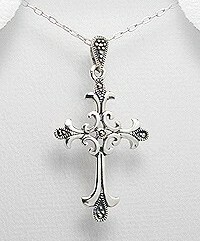 * The adorable sterling silver cross below right (a little larger than in the pic, which is not to scale). All you have to do is like my page on Facebook at www.facebook.com/KarinCox.Author and leave a message on the Heroes and Villains Blog Hop thread there to tell me which prize you’re most after. OR, Follow me on twitter @Authorandeditor.com and either tweet about the #villainsandheroes blog hop or RT my tweet about the #villainsandheroes blog hop. Leave a message on the comments below, to let me know you have entered. Every one of these actions constitutes one entry for each of the prizes. So if you like my page, tweet, and comment, that is three entries. The more entries, the better your chances to win. Also, make SURE you pop past the blogs of these other 27 incredible indie-published authors, like their pages and enter their competitions too! And lastly, thanks again for joining me. I hope you’ve enjoyed the hop. My Neverending Blog Tour guest blogger today is Melissa Smith, author of paranormal romance Cloud Nine, the first in the Guardians of Man series, and young adult book The Heir Apparent. Melissa lives in the midwest of the USA with her husband and two teenage sons. She dropped by to answer my questions about her latest offering, her writing process, and one crazy rescue kitty. Me: When did you know you had to write the story of the Guardians of Man? Melissa:I knew when I woke up from the same dream every morning for over a week. All I could think about all day long was this storyline that wouldn’t let me be. I would say a plantser ☺ I do a very basic outline, and I mean basic. I list the characters, the setting, what might happen in the middle and where I want the ending to go. From there everything else is free flowing. Me: Who would you say are other authors in your genre that have inspired you? Melissa: Lynn Kurland definitely, along with Jennifer Roberson. Me: Who is your favourite character from the novel and why? Melissa: My favourite is Ariana. While not the MC, she’s fun and sometimes clueless about humans in general. She’s a mix of a lot of my friends and myself. So what’s not to love? Me: What life experiences have you drawn on in writing your novel? Melissa: There’s one scene where Claire’s mother decides to have ‘the talk’ with her. It was embarrassing and funny (I can say it now) but when it was happening to me in real life I wanted to crawl into a tiny crack in the wall and disappear! Me: What made you decide to self-publish and how have you found the experience? 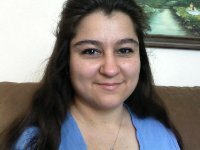 Melissa: It was after getting another in a long string of very nice form rejection letters that I decided to look into other options that might be available to me. That’s when I found Writers Beware and an article about self-publishing. Me: Did you work with an editor and formatter or go it alone? Melissa: I format my own work and do a quick edit before I send it off to another set of eyes for editing. Me: Tell me one crazy fact that few people know about Melissa Smith? Me: Yikes! That is one crazy fact and one crazy cat! Second last question: do you listen to music while you write? If so, share some of your favourite writing tunes. No! If I’m listening to music I like, I can’t seem to help myself…I have to sing along! Me: Melissa, what is the one thing you hope readers take away with them after reading your book? Melissa: A feeling that they didn’t want the story to end. Thank you, Melissa, for guest blogging and best of luck with Cloud Nine and the further releases in the series. You can buy Melissa’s books on Amazon, or at Barnes and Noble. or stop by her blog.